​Garlic promotes heart and cardiovascular health and helps maintain cholesterol levels that are already within the normal range. 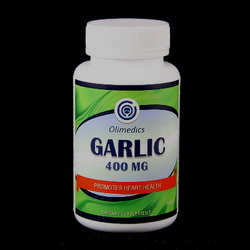 Garlic also contains beneficial antioxidant properties. Other ingredients: Dicalcium phosphate, microcrystalline cellulose, croscarmellose sodium, vegetable stearic acid, enteric coating, silicon dioxide and vegetable magnesium stearate.